Ernie: Tonight, I shall perform Singin' in the Rain. Eric: Ah. Gene Kelly did that very well. Ernie: Yes. But I shall do it just that little bit better. On the first page of Doomsday Clock #3, we clearly see the Comedian’s badge. It has a little highlight on the edge, a little arc where the colour is slightly lighter, a simple artist's trick to indicate that this is a shiny badge which reflects the light. 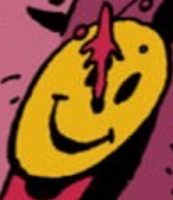 Each time we saw it in Watchmen, it was simply a yellow disc. A trivial thing; a tiny thing. A minor difference in artistic style. But it irks me. Watchmen is said to have brought realism to the world of superhero comics. But the art still looked like comic book art. The characters looked like comic book characters, but they talked like real people. Kind of. We are going to go back and redo a classic comic book. But we are going to improve on it. And the way we are going to improve on it is by making it more shiny. More realistic. We are going to show you Rorschach alongside ther Batman. 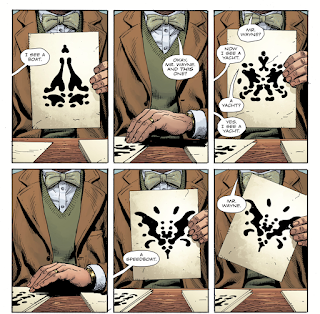 We are going to show you ther Batman easily outwitting Rorschach. We are going to try to pretend that Scooby Doo Meets Watchmen is ever so slightly more realistic than the original comic. We see the murder of Comedian, which was only shown in fragmentary flashbacks in the original comic. It has been dubbed into the new, photo-realistic style. We see it from a neutral, camera-man’s point of view; where the original comic showed it subjectively, from the point of view of the killer. As he falls, the camera focuses on the shiny, blood splattered badge. The final frame of page 2 shows us the badge by itself, on a black background. Realization dawns. 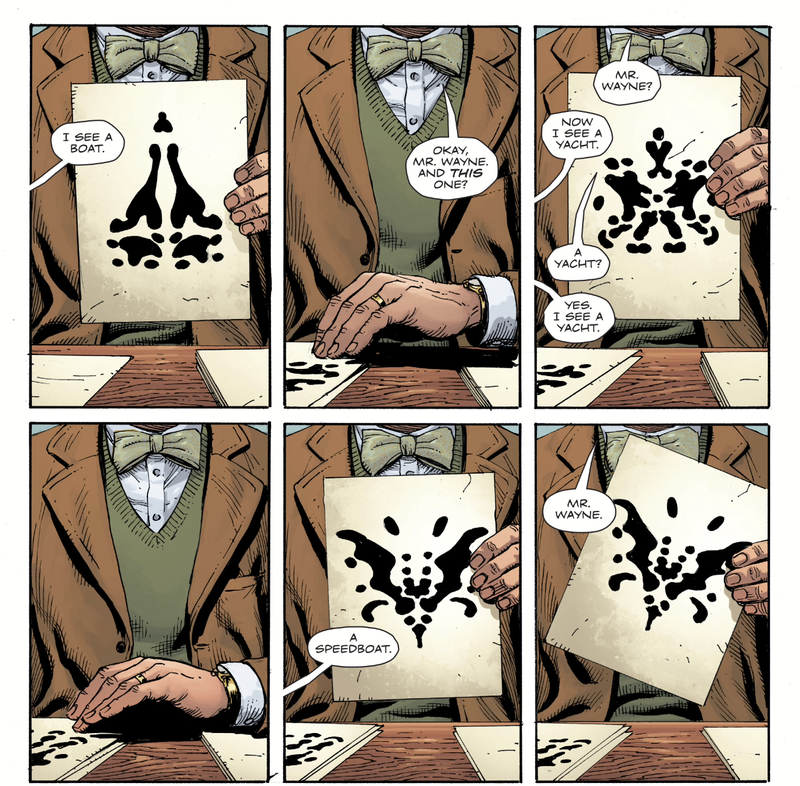 Doomsday Clock is for people who saw the movie, but never read the comic. No-one attempts to sing The Times They Are a Changin’. I would have liked it better if they had. Whatever Doctor Manhattan is planning, part of his purpose is to erase Watchmen the graphic novel. The dead Comedian has been teleported out of the story. No corpse to bury; no badge for Rorschach to find. A very large chunk of the graphic novel never happened. No interesting conversation or confrontation between fake Rorschach and ther Batman is forthcoming. Rorschach gives ther Batman the original Rorschach’s journal, and ther Batman says that Doctor Manhattan is in Arkham Asylum, so they go off together to bust him out. But…gotcha…it was a trick, and when Rorschach goes into the cell where Doctor Manhattan is meant to be, ther Batman locks him in and leaves him there. The episode ends with Rorschach shouting “Let! Me! 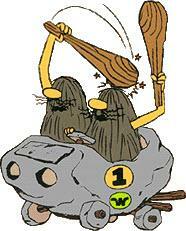 Out!” like a psychopathic Fred Flintstone. In the old Avengers / Justice League cross over, all the other superheroes have an enormous fight while Batman and Captain America go to the Batcave and sort everything out like civilized people. There is an old geek joke that the answer to the question “Who would win a fight between Batman and X” is always "Batman" because while other characters may have superhuman powers, Batman’s power is that he is a BADASS. He is more of a badass than Rorschach, at any rate. The deal appears to be that DC characters can run rings around the Watchmen characters because they are 1980s comic book characters and the DC characters are real. Where fake Rorschach got real Rorschach’s journal from, we do not yet know. In the graphic novel, it was last seen in the possession of the two guys from the New Frontiersman, but that part of the plot may very well have been overwritten. We see fake Rorschach’s face: the unmasking is shown as if it is a big reveal, as if we ought to know who the young black guy is, but I certainly didn’t. 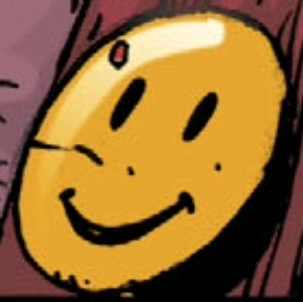 Doomsday Clock is taking place 7 years after the end of Watchmen, so my first guess could still be right: Bernie from the newstand would be 19 or 20 by now. But we see fake Rorschach dreaming that he is driving away from Ozymandias’s squid, which suggests that he was old enough to drive a car in 1987. The Comedian and Ozymandias have a five page fight scene. The Comedian throws Ozymandias out of the window but he survives. Lex Luther is badly injured. A surprising amount of space is given over to a fictional black and white detective movie called The Adjournment featuring a fictional detective called Nathaniel Dusk. Nathaniel Dusk is an obscure DC character; he appeared in a couple of mini-series in the 1980s. It appears that this fictional film is meant to have the same ironic connection with the action that Tales of the Black Freighter did in Watchmen itself. I am sure that remarks like “there’s a big twist where one of the dead guys turns out to be a killer, too” will turn out to be terribly ironic or prophetic in retrospect. I fimd the Black Freighter stuff much the least interesting part of Watchmen, although obviously I never, ever skip it. One of the people watching Nathaniel Dusk on TV is a Mr Thunder. Mr Thunder is a resident in an old people's home, and is expecting that his family will come and visit; like Godot, they never show up. There is quite a lot of conversation at the old people’s home, none of which seems relevant to the main story. 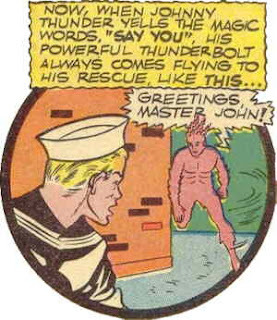 Mr Thunder is presumably Johnny Thunder. Johnny Thunder was an actual DC character actually published in the 1940s. He was also a member of the Justice Society of America, which again, was an actual comic. The Justice Society is to DC Comics very much what the Minutemen are to Watchmen: the aging heroes of a previous generation. In the 1960s and 1970s, the Justice Society was deemed to have existed in a parallel earth, Earth-Two, whereas the contemporary Justice League lived on Earth-One. 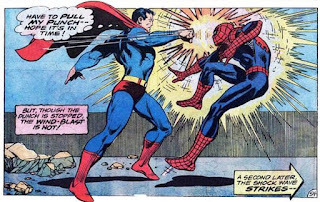 Then, in the 80s, Marv Wolfman promulgated a dogma that the Justice Society and the Justice League both existed in the same continuity, the J.S.A in the 40s and 50s, the J.L.A in the 70s and 80s. I am not entirely certain what the current doctrinal position is, but I assume that the status of the J.S.A is going to be changed, again, through Doctor Manhattan’s tinkering. This may turn out to be very interesting if you are keeping tabs on the ins and outs of the DC universe. In the comic that we have in front of us, various senior citizens watch TV for several pages, and no answer to the question “Who are these people and why should I be interested in them?" is forthcoming. The Mime and Marionette walk into a bar. (Ouch. It was an iron bar.) There is a comedian (geddit?) telling very weak jokes. The bar is on the Joker’s territory; after beating up everyone in the bar, Marionette says that she is going to go and look for the Joker. The Mime seems to be actually able to kill people with his imaginary gun. Marionette implies that she was at one time pregnant with Doctor Manhattan’s child. They both wear clown make up and would fit into a Joker story fairly well. Please, flying spaghetti monster, do not let it turn out that the Mime is Doctor Manhattan's son. The comedian in the bar is Stewart Lee. Not a caricature or a stand-in: it’s simply a portrait of Stewart Lee. Stewart Lee is a British comedian. He deals in sweary, surreal, bad-taste, politically inspired riffs which often do not have punchlines. Someone throws a glass in Stewart Lee's face. It is said that in the 1970s, Marvel Comics stopped ignoring Jack Kirby and became actively hostile to him. There is a persistent oral tradition that archivists used to burn priceless pages of Kirby artwork as an initiation rite. 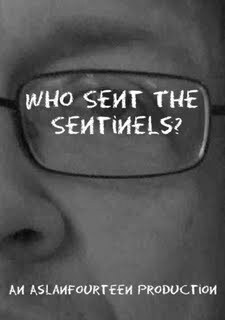 Another story says that photostats of his work used to appear on bullpen noticeboards with puerile, disparaging lettering added. 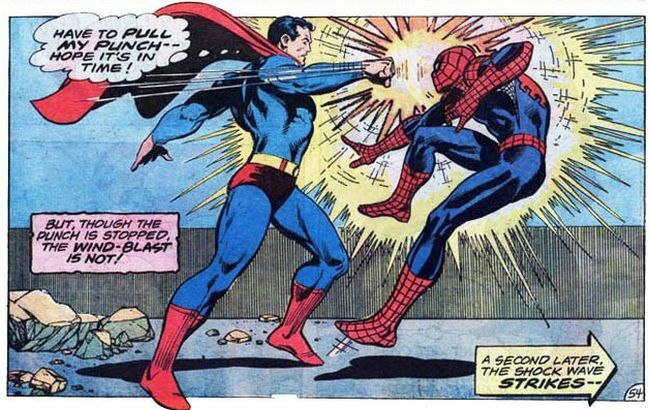 It is certainly true that the letters pages in The Eternals were filled with knocking copy; and that editorials started to appear saying that Peter Parker would never have asked for co-ownership of characters which he had co-created. The wheel turned around and the wheel turned around and now Marvel revere their co-founder as much as everyone else. Doubtless Alan Moore’s genius will be recognized after he is dead. But right now, this comic has passed beyond not being very interesting and become the literary equivalent of taking a match to Alan Moore’s legacy. Give me money. Give me money. Give me money. Give me money. Give me money. Give me money. Give me money. Give me money. Give me money. Give me money. Give me money. Give me money. Give me money. Give me money. Give me money. Give me money. Give me money. Give me money. Please..
Buy my book. Buy my book. Buy my book. Buy my book. Buy my book. Buy my book. Buy my book. Buy my book. Buy my book. Buy my book. Buy my book. Buy my book. Buy my book. Buy my book. Buy my book. Buy my book. Buy my book. Buy my book. Buy my book. Buy my book. Buy my book. Please. ....Richard Smith is looking forward to the Colston Hall name change - how about Hally McHallface or Star Bucks [sic]. And would you like Bristol renamed next year too, since a lot of its wealth in the past was made from the slave trade, and sugar and tobacco? Of course neither [correspondent]mentions the significant philanthropic contributions that Colston made to Bristol...and neither acknowledges the realities of the times that Colston lived through and that his involvement with the slave trade should be seen in that light. But then should we be surprised that the Countering Colston arguments are so one-dimensional and biased, because behind them is the sort of anti-establishment anti-capitalist slant of the Bristol Radical History Group[?] Looking at its website shows how they would like our history rewritten with conscientious objectors the only true heroes of war, Churchill the evil war-monger who incited WW2, and the renaming of the Colston Hall the first "domino" to fall. ...Colston was a significant person in the history of Bristol whose name should continue to appear, though his slave trade involvement should be highlighted in the context of the times he lived in as well as his philanthropic contributions. And before you call be a right wing racist, I am an educated liberal Bristolian with a passion for history, Bristol, education, and fairness. I am getting totally fed up with the non-Bristolians of lower Clifton etc imposing their views on true Bristolians over historical events that happened more than 300 years ago. Now they have finished their uni courses and settled down here, they seem to think they are the best thing since sliced bread because they are so-called educated and can impose their minority views on us! For the non-Bristolians who want to have a rant at me because in their eyes they think I am an ignorant outdated racist (which I am not) I am actually a fairly successful career person who was born in this great city of ours but detest when the former uni students demand our history is changed because of their unrealistic left wing views. To be a fan is to be a fan of your good memories of a book or a film or a TV show. The real thing can’t ever live up to those memories. Fans are by definition the audience least capable of deciding if a reboot of a cherished movie or comic book has succeeded. To be a fan is to be preoccupied with actual texts: it is the general reader who is content with his good memories of those texts. You may warmly remember watching Wacky Races when your were six; but I can tell you who won in which episode and point out that the Compact Pussycat was miscoloured for two frames in episode 12. Because they are closely engaged with actual texts, fans can often appear pedantic and hypercritical, but this is really a way of expressing love for the material. Cherished movies or comic books are invariably rebooted by and for fans, and fans are therefore thr only audience capable of judging if a reboot has succeeded. Academic scholarship by definition excludes “good memories” of texts. Indeed, hardly anyone has “good memories” of Paradise Lost, Beowulf or the Pardoner’s Tale in the Wacky Races sense: our first encounter with those texts is almost always in a classroom; and it is only the texts which we engage with (even though Beowulf and The Canterbury Tales were originally popular works intended for oral performance). Some text may be studied by both academics and enjoyed by general readers; and the same individual might be an academic in the week but a general reader at the weekend. One can well imagine a college student excitedly telling her tutor how she laughed out loud at Pride and Prejudice when she first read it, and explaining what sort of a person she imagines Elizabeth Bennet to be; and being told that at college, we don’t care about the Pride and Prejudice you have built in your head, but only about the one which Jane Austen put on the page. But it would the be the student who had been reading Pride and Prejudice as Jane Austen meant it to be read. Does fan fiction engage with fan memory, or does it seek to extend the text? Is the Captain Kirk who is pictured in a romantic relationship with Mr Spock a consensus Kirk based on what we remember of a 50 year old TV show; or is it the closest approximation we can reach to the role William Shatner was actually paying in 1968? If someone produced a new chapter of the Hobbit that was so textually perfect that a scholar could mistake it for a genuine lost Tolkien manuscript, would that be “fan fiction” or merely “literary fraud”? Role-playing games are the most purely fannish of any activity because they do not have text. All that can ever exist is each participants private memory of the story. Each player independently creates the adventure in his own head. Attempts to “write up this weeks session” invariably end in tears. C.S Lewis argued that the “good reader” is the one who attends to the actual text; who re-reads his favorites books and would notice if a single word had been changed. A “bad reader” is one who skim-reads very general and cliched descriptions and makes them the basis for daydreams he has really made up out of his own head. Lewis calls the former process “receiving” and the latter process “using”. If a book can be received by a good reader, it is probably a good book; if a book is merely used by the bad reader, it is probably a bad book. So for Lewis, the fan and the scholar who engage in textual pedantry may be good readers; but the fan who fondly remembers things that weren’t even in the book is almost certainly a bad reader. Someone who was wrong on the internet once told me that I should think about Jesus — how the little children ran into his arms — before I dared to allege that He sometimes preached about judgment and damnation. When I pointed out that there was not a word in the New Testament about “little children running to Jesus” the Wrong Person said that the text had been changed by Organized Religion, and that if I really knew anything about Jesus it would be obvious to me that little children would have run to him and that he would never have talked about wailing and gnashing of teeth. At some point, the Wrong Person he had presumably read the Bible; but his memory of it — what he thought ought to be there — had completely overwritten the text. But religious texts positively demand this kind of emotional and imaginative responses. The person who has stood with the mothers of Jerusalem as they bring their children to Jesus; who has observed the disciple’s stern faces turning them away; and has seen the children’s joy when Jesus overrules them — the person who can tell you what time of year it was and can smell the flowers and the sycamore trees — is unquestionably Doing It Right. If you never danced to All You Need Is Love in 1963 then you can’t possibly understand the point of the Beatles. If your mother never read The House at Pooh Corner to you when you were a child you can’t ever find your way back to the Hundred Aker Wood. Only someone who has dumped all the faux nostalgia about the 1960s and the quite disgustingly twee patina that has built up around A.A Milne can be trusted to tell us whether these stories still work as stories and whether these tunes still work as tunes. We sometimes like old things just because they are old; if they were new we would think they were rubbish. When we like an old thing, we are always liking some actual quality in the actual thing: it is impossible to like oldness per se. 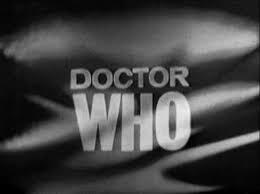 Clearly, what the BBC had transmitted was an antique and a relic: a piece of disposable wireless from a bygone age; and clearly its antiquity and its rarity and its bygone-age-ness were part of the reason I wanted to hear more of it. But I would have liked to have heard more of the thing itself: actual recordings of very posh, very over-educated people, doubtless in evening-wear, un-ironically playing a very silly parlor game. But one of the reasons that I liked the idea of very posh accents and the evening suits and the lack of irony is because they so clearly conjured up a bygone age. I quite unironically believe that The Adventures of Superman is the best and most enjoyable version of Superman, and I firmly believe that once the travesty of Man of Steel is forgotten someone will make a film about Superman as he really is is: a 1940s pulp hero. Literally the first thing we are told about Star Wars is that we have to watch it through a nostalgic lens. Some do it with a bitter look, some with a flattering word. Someone who didn’t much care for detective fiction might still become a Sherlock Holmes fan. They might like the Victorian paraphernalia; but they might also enjoy the process of explaining away contradictions in Conan-Doyle’s text and teasing out new ones — the whole Sherlockian game. But most people become textually obsessed with fan texts because they do have fond memories of their first encounters with them. We study them now because we loved them then. We fondly remember huddling round our steam powered black and white radios to watch the first season of Torchy the Battery Boy, and we think that closely studying every frame on our multimedia driverless 3D phones will recapture some of that joy. And of course, it doesn’t. The close study of a text can’t recreate the joy of actually reading the text for the first time; indeed, it may kill whatever joy there ever was. Fans are very like priests, obsessed with the form of liturgy to make up for the fact that they don’t believe in God any more. A fan is someone who is happy for his loved one to live on in his memory, even though he knows that, as the years pass, that memory becomes more and more idealized. A fan is someone who is morbidly unable to let go of his loved one, and engages in the endless mummification of the remains; the construction of vast monuments; the preservation of keepsakes and momentos. Which, as the fellow said, only serve to make the dead seem that much more dead. One thing leads to another. You took up Judo when you were 10 because you wanted to play at being a Teenaged Mutant Ninja Turtle. You kept it up when you were 30 because you enjoyed the physical and intellectual challenge. If you had seen The Princess Bride you might just as well have taken up fencing. I can’t, in fact, every be eight years old again. But the first 100 issues of Spider-Man do, in fact, exist and are easily obtainable. Please back me on Patreon. Let us pause in life’s pleasures and take a look at what Toby Young actually said. The context here is a 2012 article in the Spectator on the subject of School Examinations. The point under discussion was whether all school children should take the same examination at the age of 16, or whether there should be two or more different kinds. When my Dad was at school, there was only one kind of exam: the School Certificate. When I was at school, there were two kinds: the Certificate of Secondary Education, for the pupils who were expected to leave school at 16 and get a job; and the General Certificate of Education, for those who intending to stay on at school and go to college. The C.S.E had been created for the old Secondary Modern schools, and tended to be in technical and practical subjects like photography and metalwork. The G.C.E (more commonly known as the “O Level”) was created for the old Grammar Schools and tended to be in more academic subjects like history and Latin. In 1988 these two exams were combined into a single General Certificate of Secondary Education. When Mr Young wrote the offending article, the idea of bringing back the old “O” level was being mooted. Young was very strongly in favour of this idea; he had apparently been talking to some people who were very strongly against it. The reason that the “two tier” exam system is controversial can be encapsulated in the fact that throughout the article, Toby Young equates “more technical and practical” with “easier, for stupid people” and “more desk based and academic” with “harder, for clever people”. Not two different kinds of exams, equal but different, with (to make up a phrase on the spur of the moment) “parity of esteem”: but a Good Exam and a Bad Exam, or at any rate Better Exam and a Worse Exam. If we were actually having a discussion about exams and how best to measure the achievement of school-leavers then you could make out a case for “two kinds of exam” and you could also make out a case for “only one kind of exam”. It is not the sort of question which has a definite right or a definite wrong answer. My personal theory is that it is very hard to persuade an employer that the holder of a “Grade D English” has shown himself able to write correct, grammatical, well punctuated essays and would therefore be quite able to hold down an office job, even though the person with the “Grade A English” had shown he could use the language with more maturity, flair, and fronted adverbials. I think that a lot of employers leap to the conclusion that the holder of the Grade D can hardly read or write. I also think that there are people who are perfectly competent at arithmetic but hopelessly confused by calculus and geometry, and that it is better to present an employer with a “Grade I CSE Maths” than a “Grade D O Level Maths” even if both represent about the same level of numeracy. So like Toby, I would run with two different kinds of exams. By an astonishing coincidence, this is the system I grew up with. But Toby Young isn’t actually talking about exams. Toby Young is actually talking about conspiracy theories. The gist of the essay is that sinister forces called “inclusion”, “equalities”, “Harriet Harman”, “the therapy squid”, and (of course) “political correctness” have turned state schools into a dystopian nightmare. His first bugbear is equality and specifically the 2010 Equalities Act. Young thinks that the idea of equality in the political sense — that everyone should be treated the same — necessarily leads to the belief that everyone actually is exactly the same — and then to what he calls an “all-must-have-prizes” culture. ”All must have prizes” is a reference to the Caucus race in Alice in Wonderland: it was impossible to win, but everyone participant got a prize just for showing up. But it is also the title of a book on education by the far-right conspiracy theorist Melanie Phillips. It isn’t clear if Young literally believes that “schools” nowadays give prizes and qualifications to everyone regardless of ability, or if “all must have prizes” is just a code word for “oh, isn’t everything awful nowadays”. “Functionally illiterate” could be hyperbole. We have all heard Grammar Pedants fulminating that "young people nowadays are functionally illiterate" when what they really mean is that they've just spotted someone writing “who” when they should have written “whom” or putting exclamation marks at the ends of sentences which don't begin with “What…!” or “How…!” But “with a mental age of six” is pretty specific. O Levels are taken at age 16, and a person of 16 with a mental age of 6 is the very definition of special educational needs. So. Either this man really believes that the Equalities Act requires all school exams to be easy enough that a severely mentally handicapped person can take them; or else by “functionally illiterate with a mental age of six” he really means “the kind of person who would have gone to a Secondary Modern and done CSEs under the old system”. Which is better than calling special needs students cave-men, but not much. It takes us right back to that infant school teacher and her dummies and dopies. I cannot help mentioning that J.C Wright (who has by now failed to win so many Hugo Awards that I have lost count) says that anyone who went to an American state school is a “zombie” or a “moorlock” and when pressed insists that he believes this to be the literal truth. The Equalities Act might very well allow the mother of a 16 year old who can neither read nor write and has the cognitive ability of a 6 year old to say “My child has the same right as every other child to an education that is appropriate for him or her.” It could not possibly be interpreted to mean “My child has the same rights as every other child to a GCSE in English Literature” This is fantasy and Toby Young must know that it is fantasy. 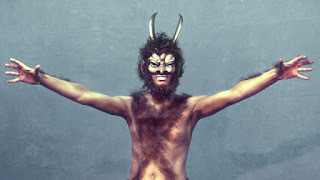 He gets deeper into the realms of fantasy when he starts to talk about a bogeyman he calls inclusion. There is nothing wrong with hyperbole; I myself have used hyperbole on billions of occasions. But words do have meanings. If someone says “You never see anyone on the BBC who isn’t a one-legged black lesbian” they may not literally mean that you never see anyone on the BBC who isn’t a one-legged black lesbian. But it is reasonable to infer that they think that you would naturally expect that only white able bodied heterosexuals should appear on the BBC. If you don’t agree with them on that, the joke isn’t funny. So what do Young’s words mean? And what does he mean by political correctness? Does he just mean “the idea that you shouldn’t use words which denigrate or belittle people”? (But what’s so ghastly about that?) Or is is he one of those who thinks that “PC” is part of a plot by Jewish intellectuals in Frankfurt to destroy civilization as we now know it? I don’t imagine that Young has done a survey and discovered that all school have all 14 of Alice Walker’s novels on the shelf; and that no school has a work by Mark Twain. It seems overwhelmingly unlikely to me. I would imagine that copies of Tom Sawyer are much easier to track down than copies of The Colour Purple. But of course Young hasn't picked a random example. Mark Twain is a white guy; Alice Walker is a black lady. The implication is that schools are removing books by white males and replacing them with books by black females. He expects his readers to agree with him that this is “ghastly”. Inclusive doesn’t mean “both black writers and white writers” — it means “no white writers”. It’s about as clear an example of a racist dog whistle as you could imagine. Equally obviously, he doesn’t really think that all schools have an S.E.N department that are skilled in the treatment of Munchausen’s Syndrome By Proxy. He has picked on Munchausen’s Syndrome by Proxy because the name sounds funny. He places the obscure condition with the funny name alongside the common condition because he wants us to infer that catering for children with dyslexia and catering for children with Munchausern’s Syndrome by Proxy are both equally ghastly ideas. Young maintains that the real reason that some people want a single, unified exam is that they fear that children put in for the easier one would “suffer a permanent blow to their self-esteem”, that they are “so fragile that the ‘stigma’ of not doing O-levels would cause permanent damage”. He extends this into a wider allegation that “teachers” are no longer interested in passing on knowledge and see themselves instead in a therapeutic role (where “the therapy industry” is another Bad Thing). But this is a straw doll. I don’t think that the main argument against selective education is that the children put into Secondary Modern School or the lower stream will feel sad. I think that the main argument is about results. The claim is that overall, looking at both troglodytes and Spectator readers, you get better educational results if everyone goes to the same school and sits the same exam than you do if you sent the clever people through one door and the less clever people through another door. It is a claim that could theoretically be tested. It would be fairly easy to look at an area with a unified system and an area with a two-tier system and find out which population gets the best educational results over all. But of course Mr Young has an argument which trumps all of that. He can prove that segregated exams are better than unified ones, beyond any contradiction. He went through the old GCSE / O Level System and he turned out all right. He did CSE’s; he failed his CSE’s; he went back to school and took some O Levels, he went to Oxford and now he writes for the Spectator. So he is living proof that the system works. Stick close to your desk and never go to see and you all may be rulers of the queens navee. Discussions about education always seem to founder on the rocks of the Argument From Individual Personal Experience. In another article, Young literally says that he would be okay with schools being allowed to beat students because he was beaten and it didn’t do him any harm. The case for the defense, then, is that Toby Young did not say that special needs children were troglodytes, or that wheelchair ramps were ghastly. Not quite. What he did say was that schools are run by softies who won’t allow children to fail in case it makes them sad; that the 2010 Equalities Act forces schools to make exams so easy that mentally retarded children can pass them; that white authors are banned from school libraries and black authors are mandated; and that all this is in some way connected with something he calls political correctness. Regular readers will have spotted why I found this so interesting. Young’s essay utilizes arguments which are remarkably similar to those in Screwtape Proposes a Toast. The Toast was published in 1959. O Levels were still in full swing; middle-class children went to grammar schools and dummies and dopeys to secondary modern; dyslexia was much less well understood and there was no obligation to make schools wheelchair accessible. Most teachers still had a cane in their cupboard. And yet the complaints are exactly the same. Toby Young rails against the Equalities bill and the “all must have prizes” culture; Screwtape thinks that the belief in democracy will lead to a world where everyone is encouraged to say “I’m as good as you”. Why are the two essays so similar? I can think of three possibilities. 1: Toby Young is the Devil. 2: Toby Young has read Screwtape Proposes a Toast and has unconsciously repurposed some of C.S Lewis’s arguments for his own column. 3: In every decade, regardless of what is really going on in schools, social conservatives always say the same things. They always say that there is too much equality nowadays, that clever people are being held back to help the dunces; that teachers are too busy molleycoddling the kids to do any real reaching. They have always said this kind of thing. And they probably always will do. If you would like me to write more of this kind of thing, then please consider pledging to pay me $1 for each essay I write.